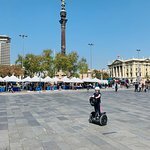 Cruise around Barcelona and see the top sights from street level without all the walking during this small-group, guided Segway tour. Glide through the city streets and paths on your self-balancing Segway to explore Gothic architecture, iconic landmarks, and urban parks during a 2- or 3-hour tour. Zoom by the old Port Vell harbor, the Arc de Triomf, the Parc de la Ciutadella, and Olympic Port. Based on the start time you chose when booking (there are multiple daily departures, for your convenience), meet your guide in central Barcelona. Get a safety briefing and learn to ride a Segway during a short instruction and practice session. Then, follow your guide as you easily navigate Barcelona’s mazelike streets. Pass the the Arc de Triomf and the Parc de la Ciutadella as you make your way to Port Vell and Port Olympic. If you've upgraded to a 3-hour tour, continue to the Montjuic, one of the city’s most recognized landmarks. Hear stories from your guide about the area's diverse history before returning to your original departure point, where your tour ends. 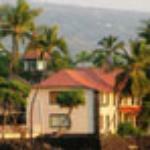 See the itinerary for a complete list of tour sights. Your first stop is Barcelona’s Barri Gòtic, in the center of the old city. Home to a labyrinthine tangle of streets, the neighborhood contains some of the city’s most impressive 15th-century architecture. Admire stately buildings sitting cheek-by-jowl with sidewalk cafes, and then pass through Columbus Square to La Rambla. Stop for photos on the famous boulevard against a backdrop of colorful flower stands, and continue cruising to Barcelona’s old harbor at Port Vell. 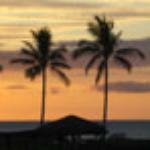 Glance at the yachts bobbing on the water and pass the glitzy Maremagnum leisure center and Palau del Mar hotel. Glide through the fishing district of La Barceloneta to see the main promenade stretching along Platja de la Barcelona, the city’s main beach. Toward the end of the beach lies Barcelona’s Olympic port, so follow your guide to it for a photo stop. Pass through Parc de la Barceloneta and enjoy a last stop by El Cap de Barcelona (the Head), a surrealist sculpture by American artist Roy Lichtenstein. Finally, return to the start point. 3-Hour Tour:After seeing all the sights taken in on the 2-hour route, continue with your guide from El Cap de Barcelona to the Arc de Triomf. Hear how the monument was built for the 1888 Barcelona World Fair, and has since become one of the city’s most distinctive landmarks. After a short stop by the monument, continue through Parc de la Ciutadella. Weave along the park’s pathways, enjoying the tranquil surrounds, and see the Cascada, a majestic-looking archway and water feature. Watch the water cascading down, and then pose for a photo by the Parliament of Catalonia, an imposing building nestled inside the park. Having enjoyed a full extra hour on your Segway, return to the start point where your tour finishes. Great way to see the city. Willy our guide was friendly and knowledgable. Would Definately recommend to keep teenagers engaged. Best fun in Barcelona - MUST DO!!! 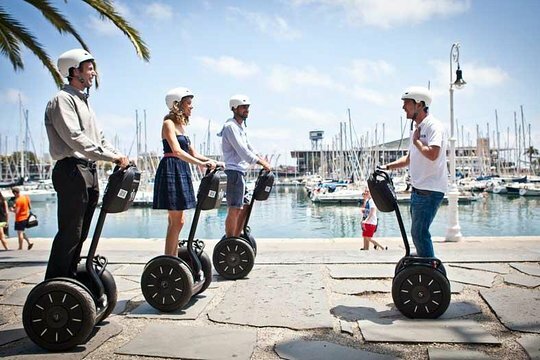 Get quick answers from Barcelona Segway Tour staff and past visitors. I am not aware of any age restriction, and believe it would not be a problem for a 14 year old to handle. As SAKaplan noted, everyone is given a helmet and lesson. In addition, the guide can set a speed limitation so that when the limit is reached, the segway automatically becomes more upright and slows down. As we became more experienced and comfortable, we asked out guide to raise the max speed setting. We had a fun time, and got to see so much of the city in a short amount of time. Enjoy! Hi, we are family of 4 (2 adult & 2 kids). The kids are aged 7 & 10 with 2-HR segway experience in Seville. 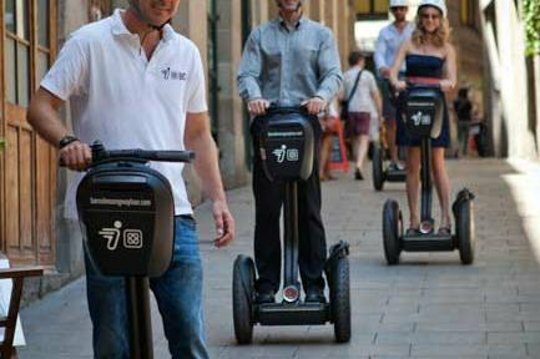 Could we join the segway tour in Barcelona? From a breathtaking area, the Arch de Triomf.